When the sun comes out, we Brits love making the most out of outdoor summer indulgences, whether it’s baking up treats ready for picnics or laying on a spread for celebratory street parties. And as a chocolate-loving nation, combining the heat with the sweet is always going to be a winner. Divine is the perfect ingredient to any chocolate recipe, with a smooth texture and excellent flavour. This is because all Divine chocolate is made with the finest quality Fairtrade cocoa beans from Kuapa Kokoo, a cooperative of smallholder farmers in Ghana. The cocoa is grown in the shade of the tropical rainforest, and slowly fermented and dried in the sun by the farmers, who take great pride in the chocolate company they co-own. 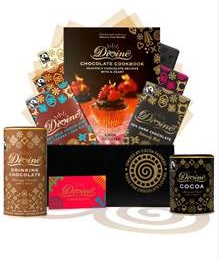 If you’re looking for Divine chocolate recipes to try, then visit www.divinechocolate.com/uk/recipes for inspiration. Now it is your chance to win one of their Divine baking hampers worth £35 filled with five of their finest 100g chocolate bars: seriously smooth milk chocolate, gloriously creamy white chocolate, milk chocolate with toffee and sea salt, rich 70% dark chocolate and 70% dark chocolate with raspberry, plus tubs of Divine cocoa powder and drinking chocolate. But that’s not all. The hamper also includes their recipe book containing over 100 delectable recipes, exclusively created by chocolate expert Linda Collister. To be in with a chance of winning, simply answer this question. Competition closes on Friday 18 September 2015.